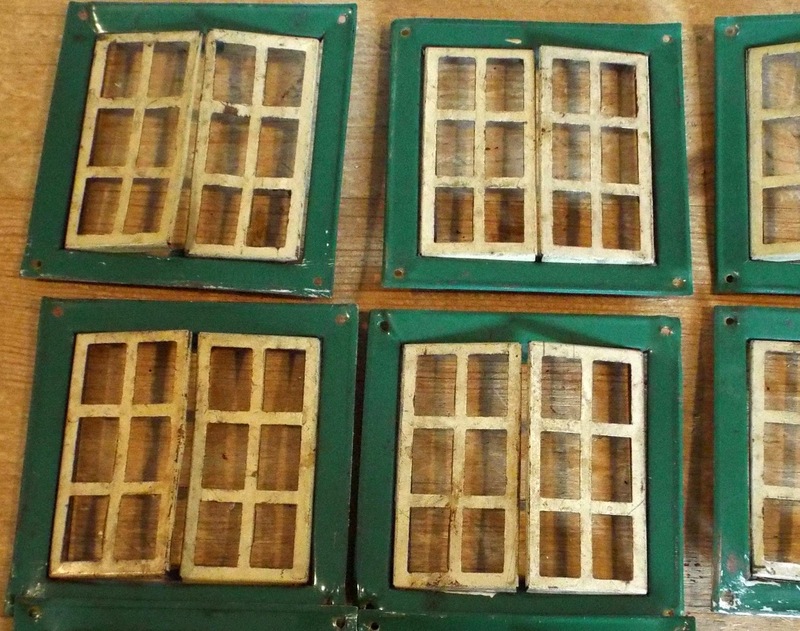 More Dolls House Restoration Pieces Including Rare 1930s Windows! 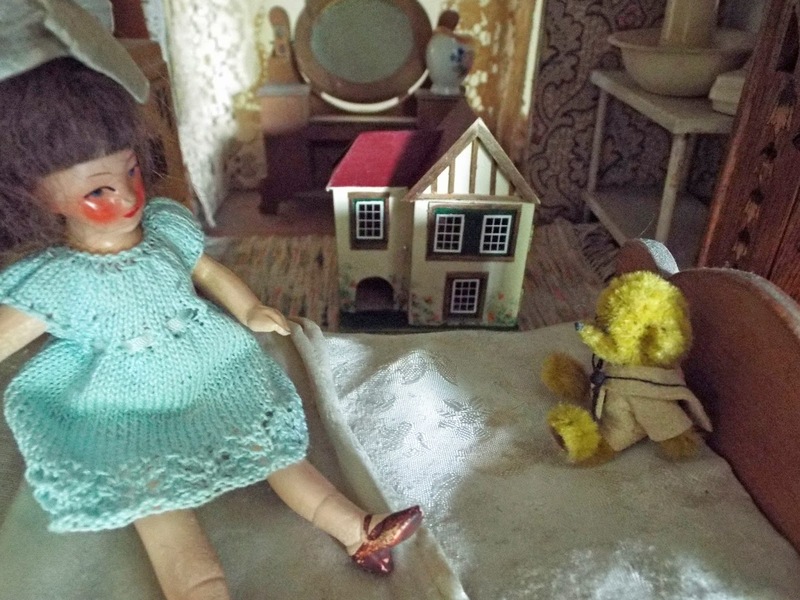 I have been continuing my massive clear out of restoration bits and bobs from my workroom that I had been keeping aside for my own dolls house restoration, but some I have had for so long now that I think it is time for someone else to put to better use. 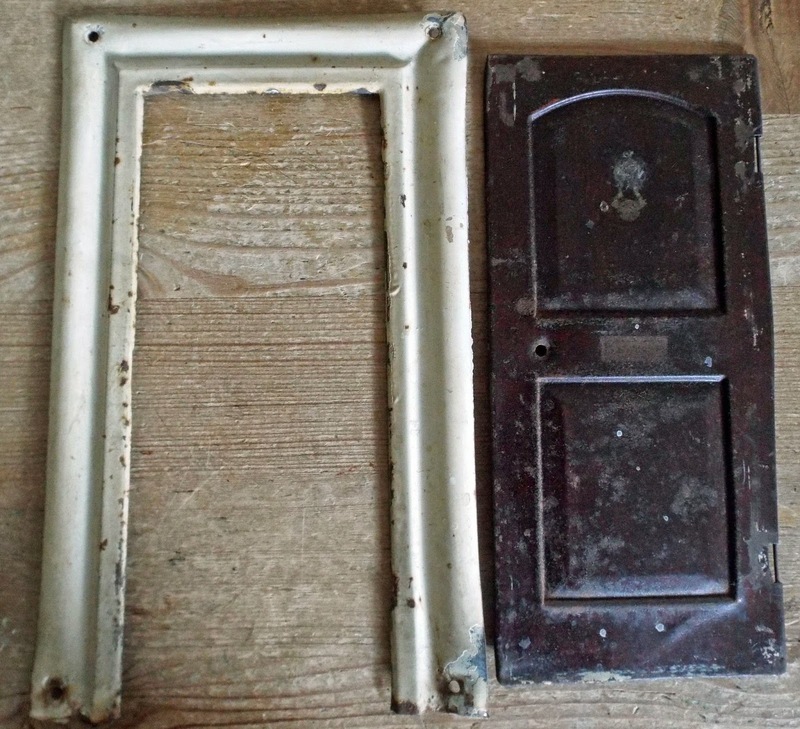 So more vintage dolls house restoration components and fittings have been listed today, including some rare early 1930s tin windows and later tin Romside windows, doors etc. 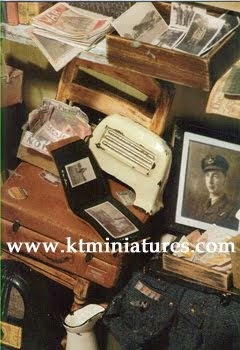 In fact, some of these bits I have had for so long, I have actually forgotten where they came from...shame on me! 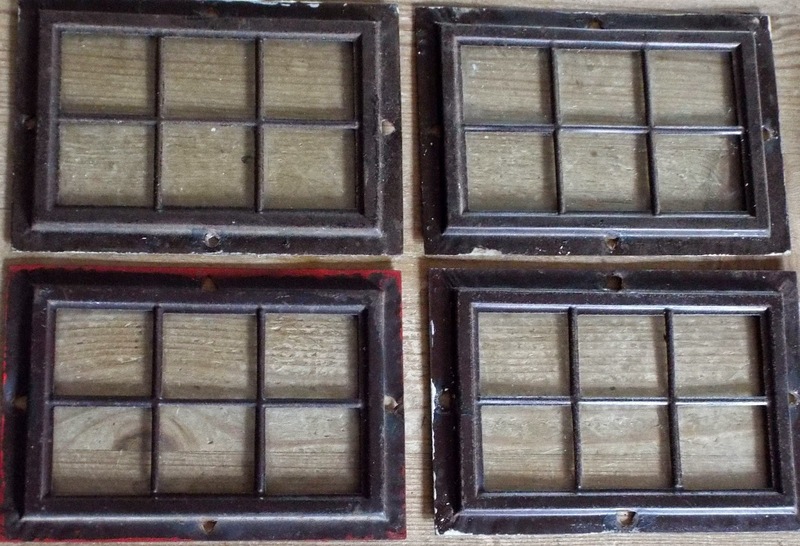 These rare early 1930s windows simply do not come along very often...in fact at first glance they could be mistaken for Tri-ang windows...but they are not. 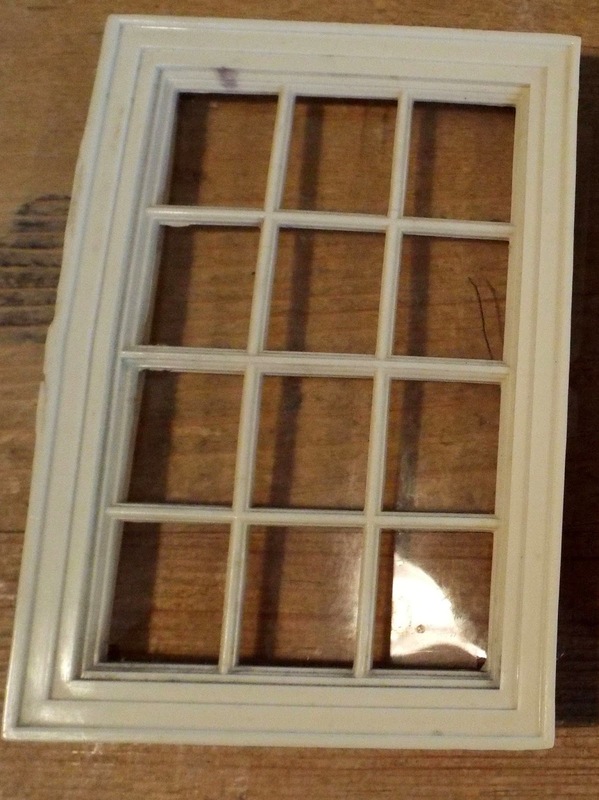 Even though they measure 3 1/8" x 3 1/8" which are identical in dimension to the smaller Tri-ang dolls house windows. 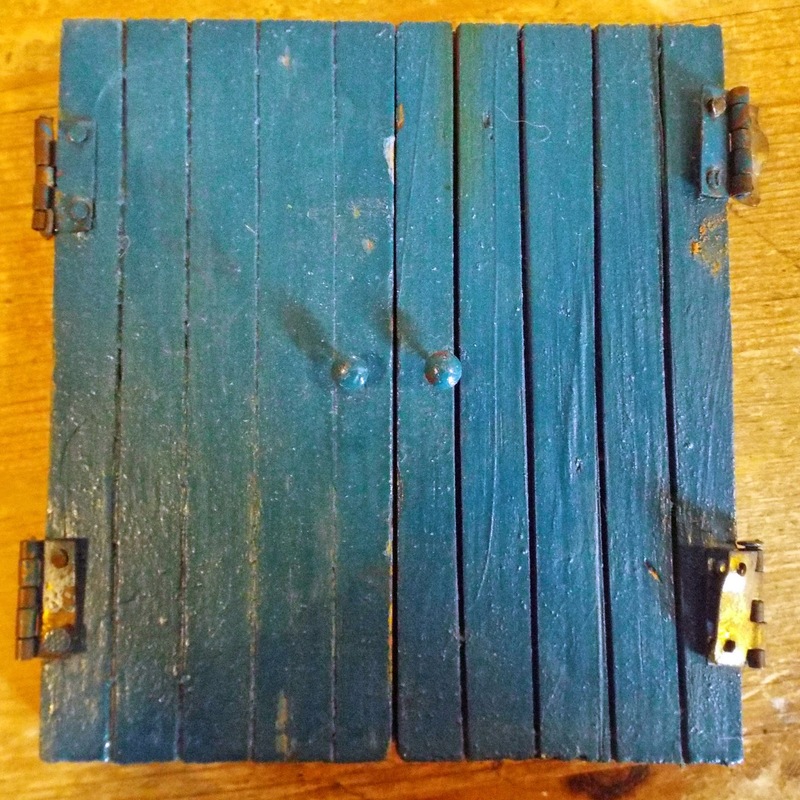 When you open them, you will see that these have a metal rod down each side which act as a hinge, so the windows all swivel open (Tri-ang windows are hooked top and bottom onto tiny tabs in order to swivel open). 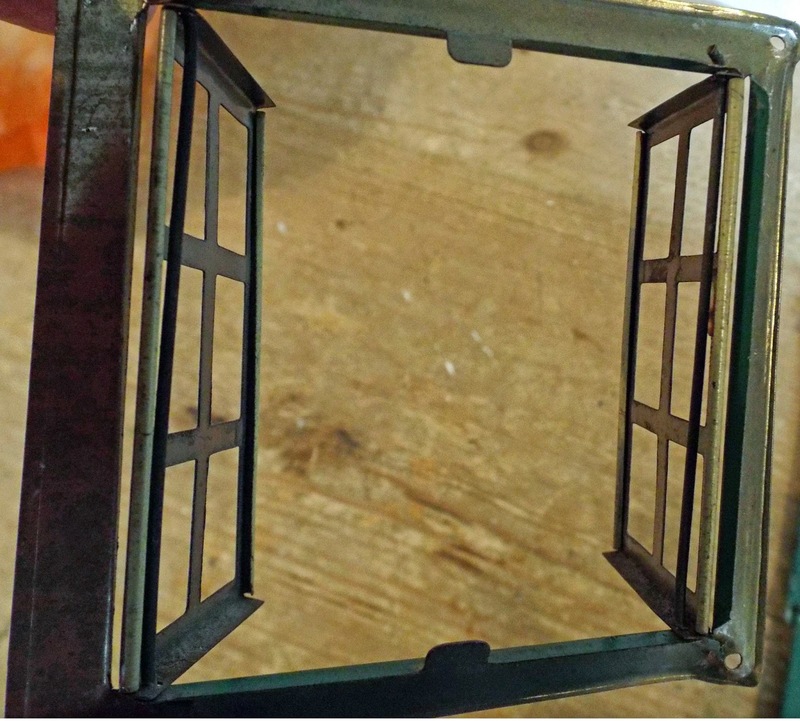 Plus these windows are attached to the dolls house by nails in the tiny holes that are found in each corner of the frames, whereas Tri-ang windows slot into the wooden fabric of a dolls house and large tabs are prised back to keep them in place. 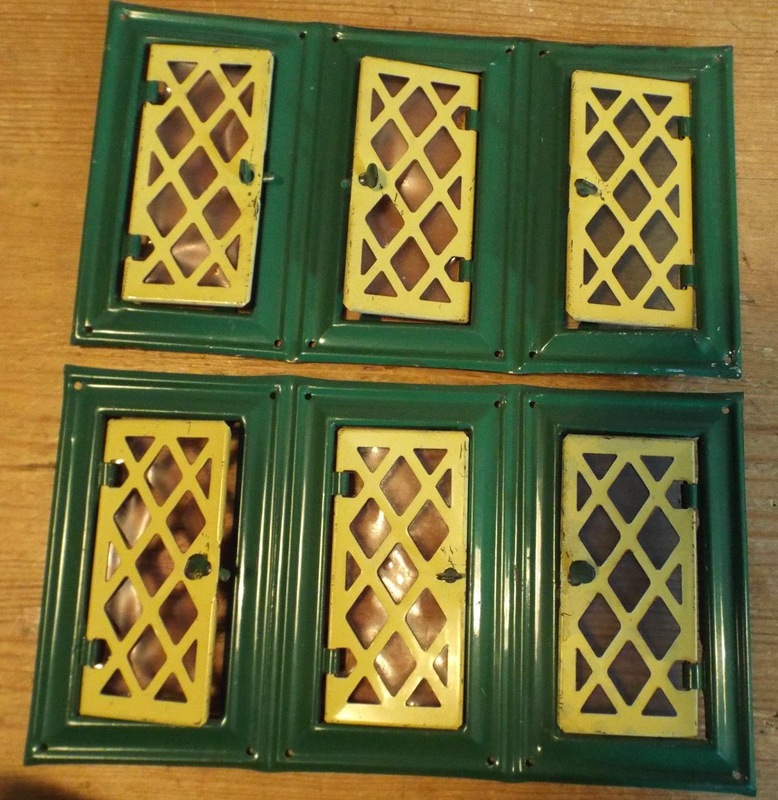 I am pleased to say that at last I have a few various tin Romside windows and doors....these are the more commonly seen type that were available from a little later, right through to the early 1970s. 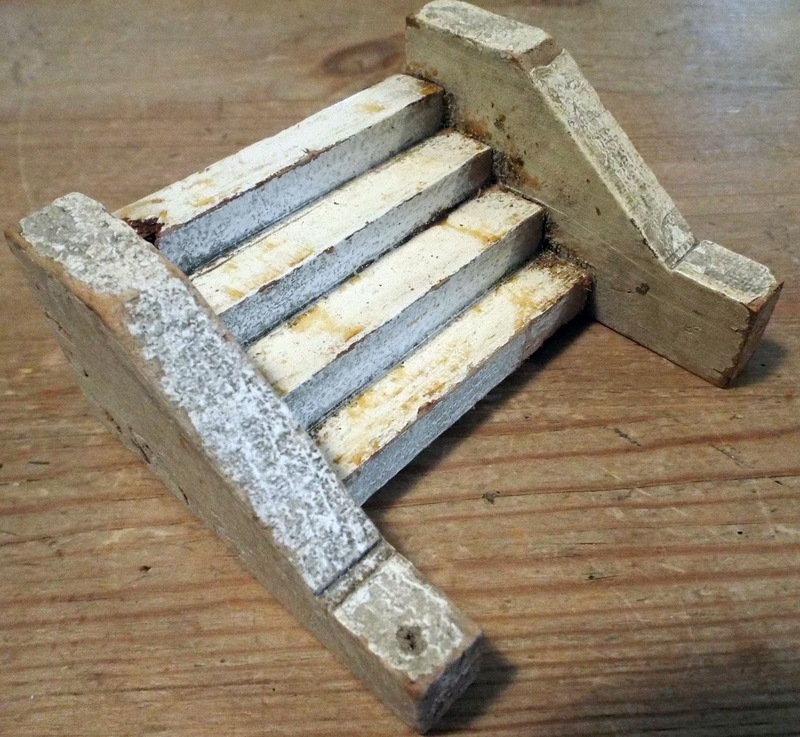 All have some varying degree of wear plus a little rust, but are wonderful if you are in need of one! 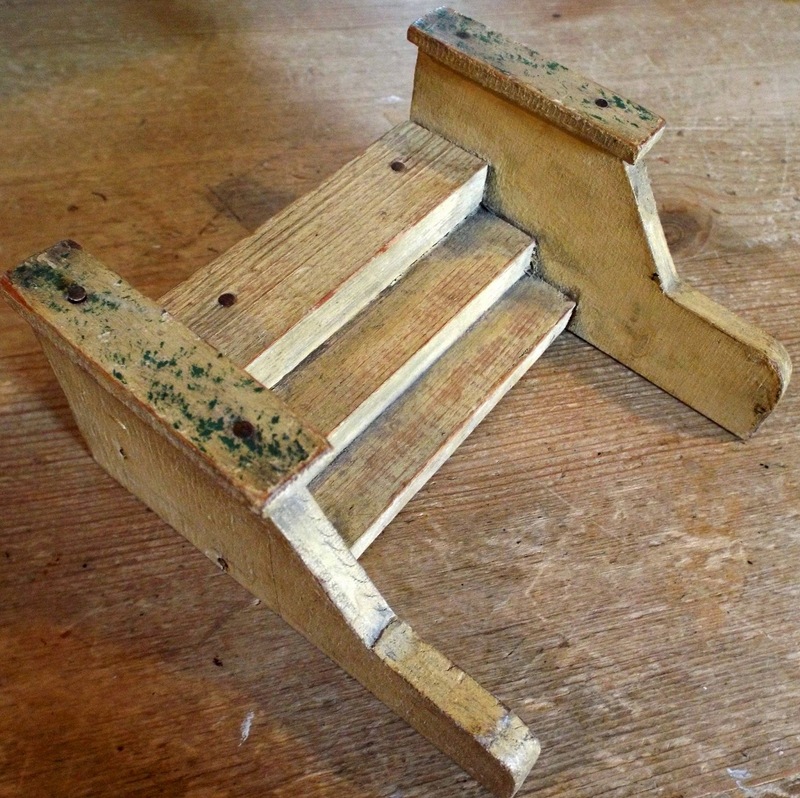 There are also these vintage wooden steps that came from an unknown dolls house but believed to be 1930s. 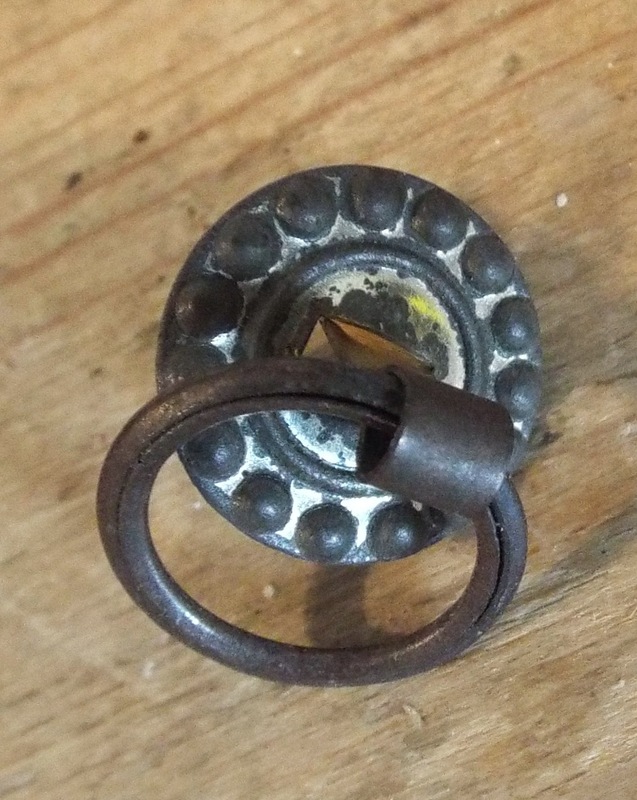 I also have two of these tiny metal decorative front door handles......could be useful for someone who is in need of a door handle? There is also this wooden gable end....again could be useful to someone. Labels: dolls house windows with rod hinges, Rare 1930s early Romside tin windows, Romside lattice tin windows, tin Romside door, vintage dolls house door handle, vintage gable, vintage steps. I have been having a mega clear out of boxes from my workroom today....of all sorts of bits and pieces that were put aside for restoration. However, many of these pieces I have had for a long while and I've still not used, so I think it's most definitely time to sell them onto anyone who will find them useful. 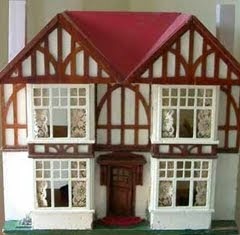 I have some c1915 metal glazed windows that came from a very sorry G&J Lines No 71. dolls house. 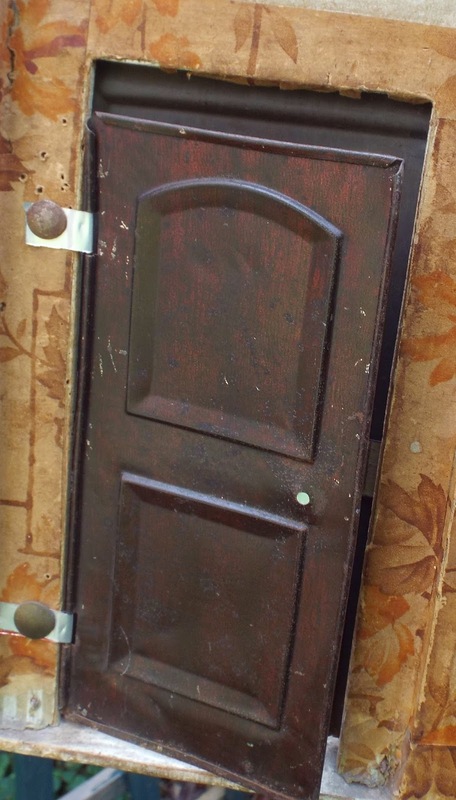 There is even a metal door and frame kept from the same house....ok, the hinged tabs may have long snapped off but with a bit of ingenuity, this can be overcome...as seen below. 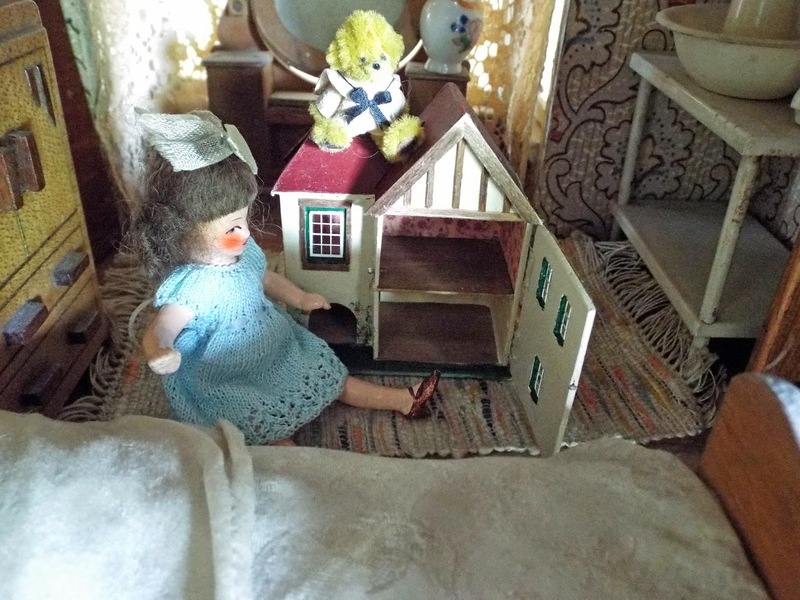 Here is a picture of how someone else got over this problem....basically thick foil (type from the top of a wine bottle), cut into strips, then threaded through the slots and pinned to the inside fabric of the actual dolls house.....very clever! 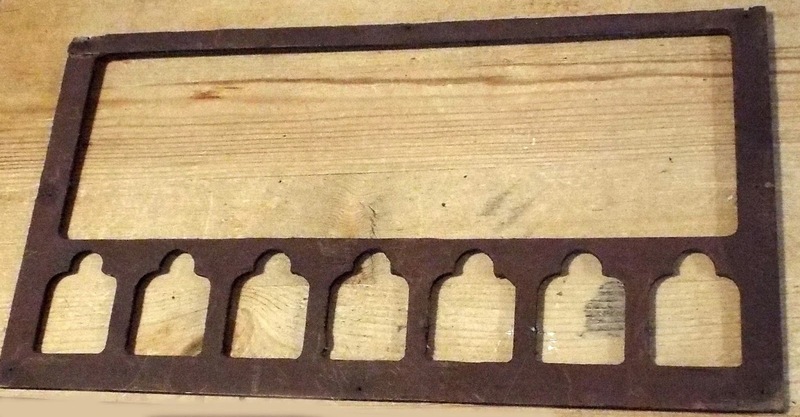 There are some various front wooden cut out panels from an ancient Stockbroker....again, I have had these for a very long time, thinking that they would be useful in restoration but after 5 years, I still hav'nt used them...so it is time for them to go. There are some side panels too. There are three different sets of big and small scale Tri-ang garage doors. 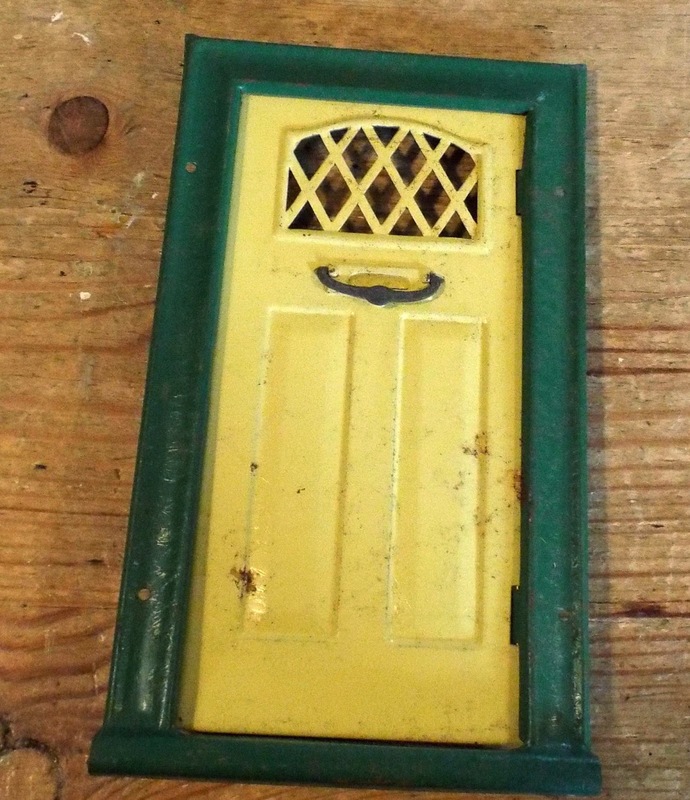 There is also a plastic window from a Tri-ang Queen Anne dolls house. Another Exhibition - A Must See! 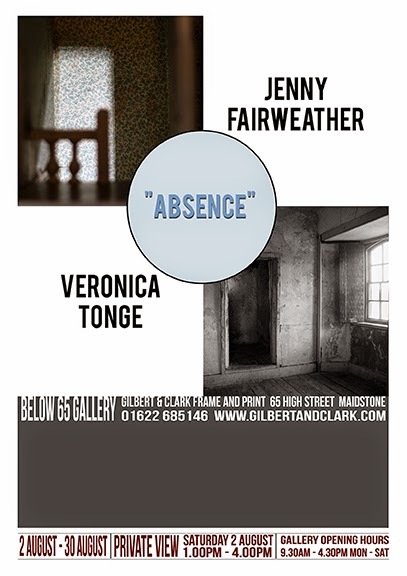 Veronica Tonge has forwarded information of another exhibition taking place here in the UK for the whole of August that may be of interest to many of you. Bohemia:Abandoned House is set in a scratch built mid 20th Century house which had an arts and crafts makeover around the 1990s. 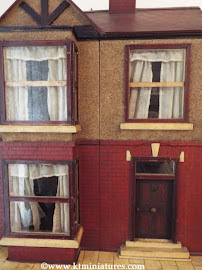 The House with the Blind Window is a response to a 1950s crime mystery story for children sited in an ELC Georgian mansion. The Pub Witnesses is a commemoration of the first ever aeroplane bombing of civillians during the First World War in Folkestone, set in a Sid Cook corner shop/pub. Veronica is also showing Alone, a contemplation on loss staged in a room box of a country kitchen, and an installation that was put together inside a wine box called Curator's Office & Way Out which comments on the current museum practice of getting rid of experts in museums and replacing them with managers. FASCINATING STUFF! I WAS SO DISAPPOINTED NOT TO HAVE BEEN ABLE TO GET TO VERONICA'S LAST EXHIBITION DURING JULY - AS MY MONTH DID NOT RUN QUITE AS PLANNED! HOWEVER, IF I CAN, I WOULD VERY MUCH LIKE TO GET TO THIS ONE. IF ANY OF YOU READING THIS LIVE NEARBY OR WILL BE IN THE MAIDSTONE AREA DURING AUGUST, DO POP IN AND TAKE A LOOK....AND LET US KNOW WHAT YOU THINK. Would You Like To Come To Our Next Workshop? With just a limited amount of spaces left available for our September workshop and just three weeks to go before booking will be closing, do take a look at the following pics and let us know asap. if we can tempt you into joining us for a wonderful creative day! 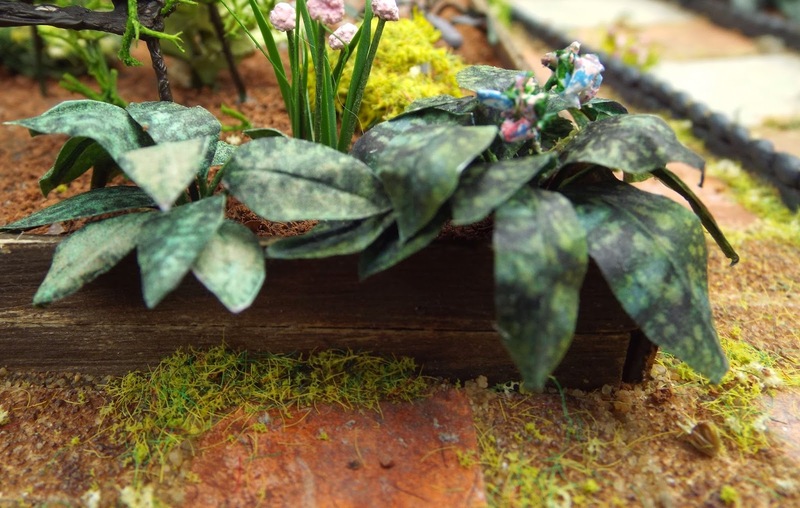 This little project has been designed to stand alone or sit alongside your old dolls house. 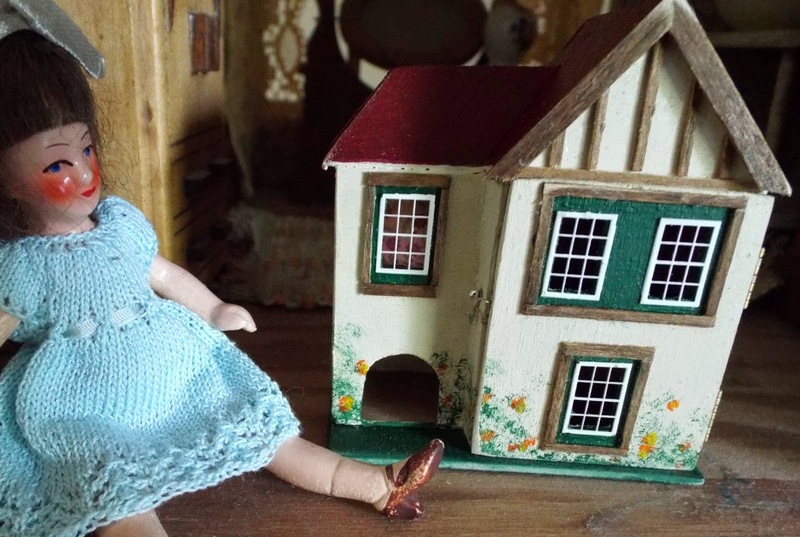 Maybe you are a vintage dolls house collector, never having ventured or even considered the creative side of the miniature hobby before....how fantastic this could look alongside an old dolls house! Our workshops are relaxed, informal, fun and friendly, you simply work at your own pace with our guidance. 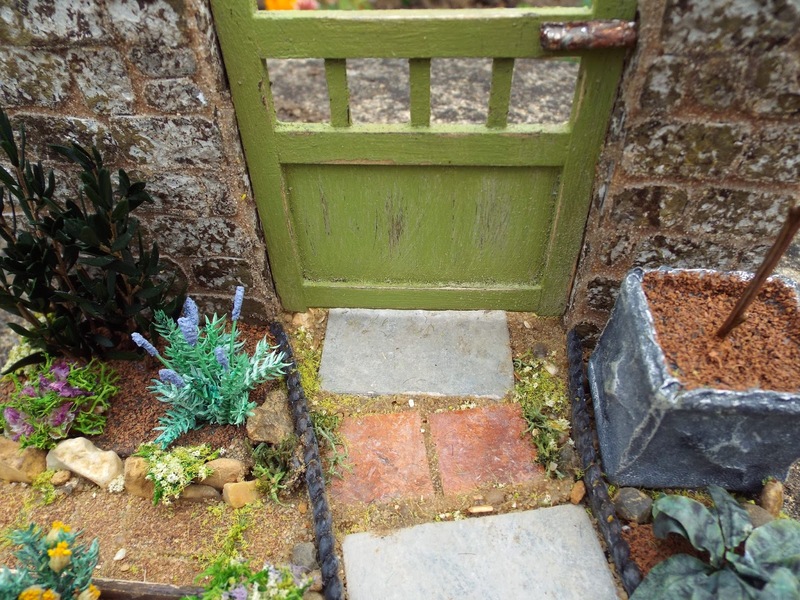 With this project, we shall be making a unique nostalgic herb garden, complete with old pavers, Victorian style rope edging, quarry tiles, old bricks plus umpteen variations of our own cottage garden herbs made from a variety of materials....some which may surprise you! 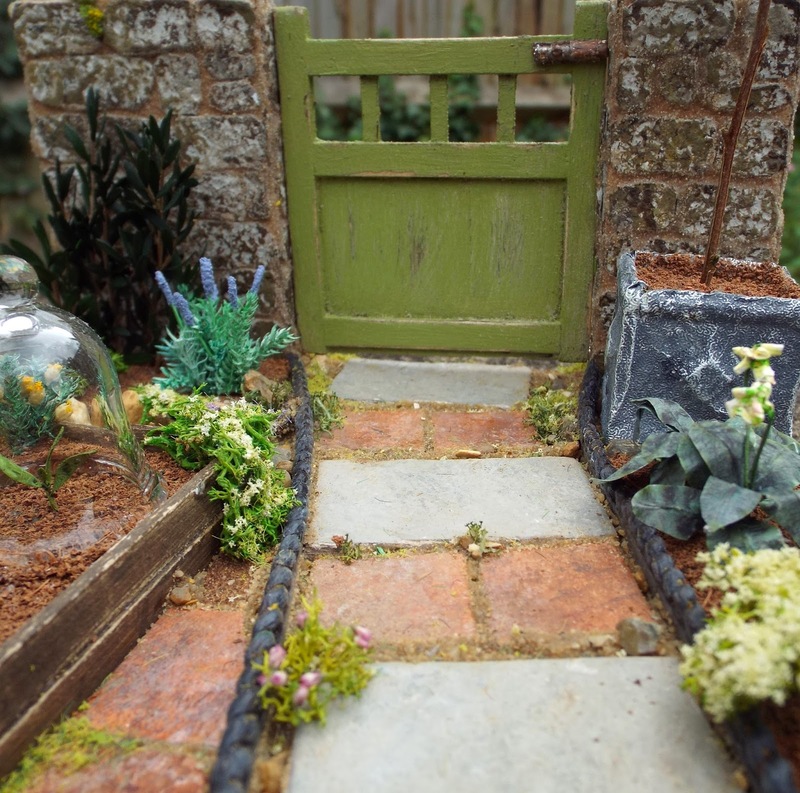 Amongst some of the many herbs included are comfrey, lungwort, different thymes, chives, parsley, lavender and even a bay tree in a wonderful decorative planter! Plus we have included other plants too such as a climbing rose on tripod and even some chard...and each attendee will be given a hand blown glass cloche made especially for us by UK artisan - Ray Storey. 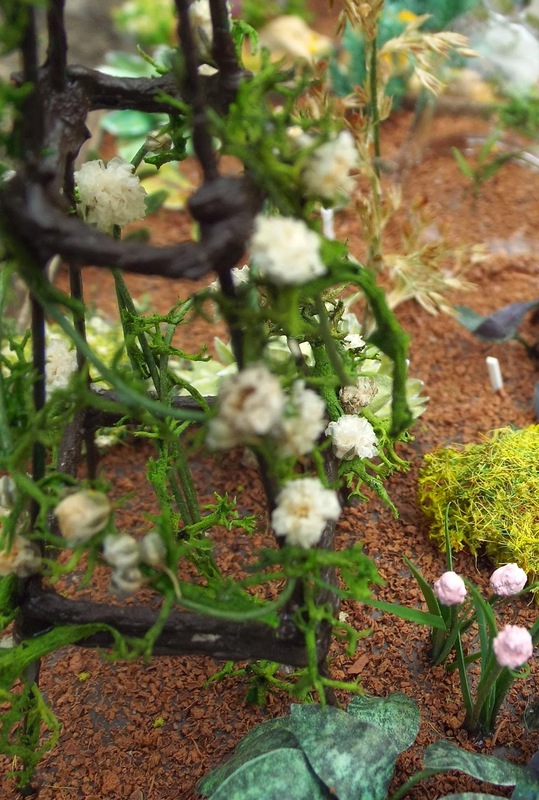 This particular project is quite unique and potentially quite versatile, so you will be able to adapt the layout to suit your own needs. We will give you more than enough materials in your kit for you to experiment, plus the know how and further ideas to inspire you to push your creative talents as far as you want. Even if you have been to our workshops before, we will be using some very different techniques and innovative ideas to inspire as always. 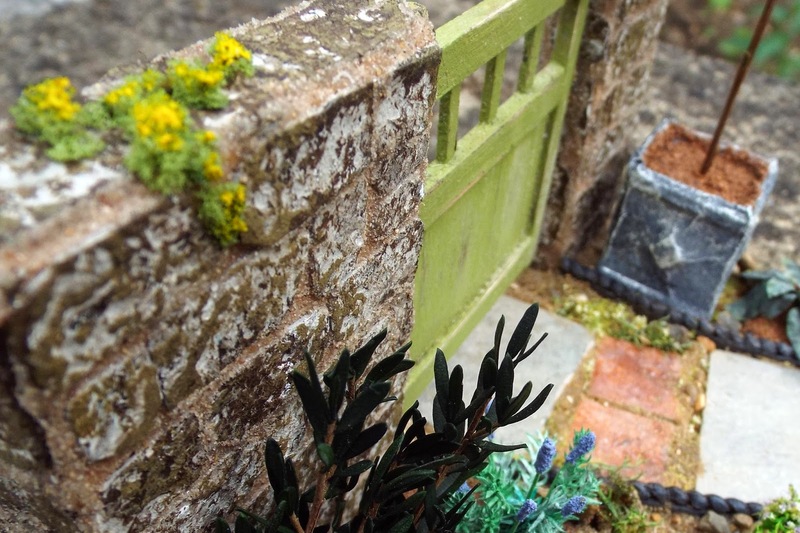 Then of course there is the rickety old garden gate complete with rusty old bolt, right at the far end, set into the low stone wall. 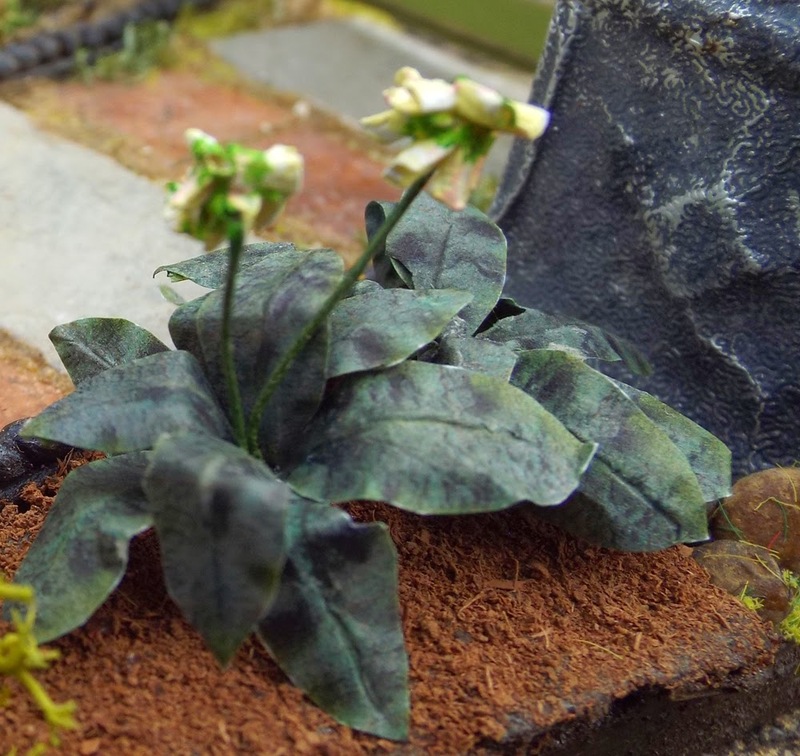 For this particular project, we would recommend the 1/12th scale as the herb leaves really are weeny and fiddly but if you are experienced and up for a challenge then you may like to have a go with the 1/24th scale. 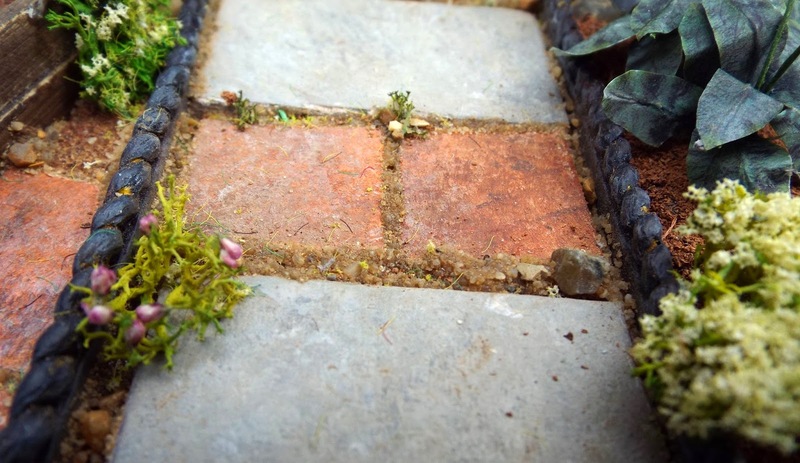 Those of you who came to the Spring Workshop, will recognise the stone wall....but don't worry, this is much smaller and far less time consuming to make compared to that one...in fact, if you really wanted, you could make the little wall at home, therefore leaving you to concentrate on the planting and landscaping at the actual workshop instead. 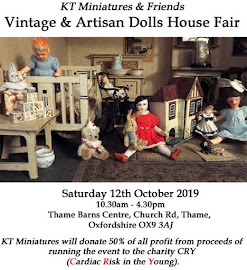 If after reading this, you may have been tempted, please get in touch with me here at KT Miniatures or Robin my workshop colleague asap, in order to reserve a space. We would love to hear from you and please do not hesitate to ask questions if you need more information. We can possibly accept one group booking for this workshop...so if there is a group of four or more of you who would like to come, please do get in touch asap. Labels: Bicester Avenue Garden Centre, Down The Little Old Herb Garden Path Workshop, Nostalgia In Miniature Workshop., Unique Miniature Herb Garden. 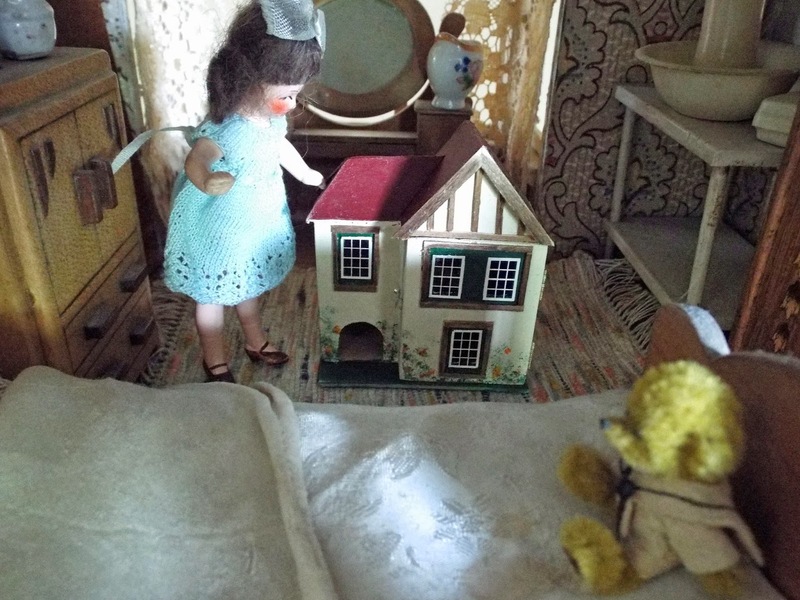 I would just like to introduce a new little acquisition for the nursery bedroom of my c1930s Hobbies 186 Special dolls house......Little Miss Dollie and Big Ted are so excited, as soon as it arrived they gave it a thorough inspection! Even the frontage opens out to reveal two rooms.....very similar to the Tri-ang No 60. 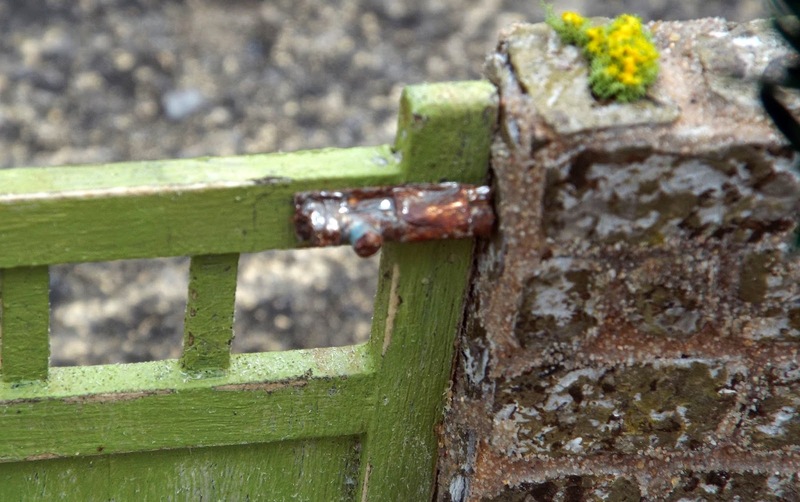 And when not in use, there is the weeniest of metal catches to keep it neatly closed, just like a real dolls house. We just need some old c1930s furniture now! This little beauty was made for me by my old mate, Deb Jackson. Isn't it stunning?! Ever since it arrived, I can't stop peeking at it. I absolutely love it!